TOLEDO, OHIO, AUGUST 30, 2012 Responding to requests from customers looking for a clean way to place one audio or video component under their wall mounted flat screen televisions, Simple Shelving Solutions, LLC (S3) has launched a new 24 inch version of their popular TV Smart Shelf. The product is available for sale to consumers on its web site and to its distributors. The 24 inch TV Smart Shelf works great for customers who only have one component, like a cable box to place under their televisions, says Michael Vanderpool, Director of Internet Sales for S3. There is also room for a smaller additional device as well, such as a Nintendo Wii, modem and router or a Roku player. The 24 inch TV Smart Shelf works will most existing wall mounts and is also available in a combo pack that includes a 32 60 inch tilting wall mount. It will work with any size television and offers the same features as the 36 and 48 inch models; height adjustment of the shelf, tempered glass and cord concealers to hide component wires. About Simple Shelving Solutions, LLC S3 is the designer of the award winning TV Smart Shelf. 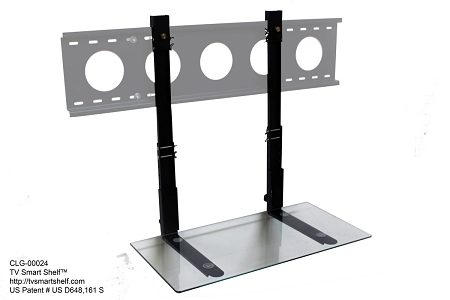 Headquartered in Toledo, Ohio, the offer shelving products for flat screen televisions available in two, three and four foot lengths and in clear and black glass. For further information, please visit http://tvsmartshelf.com or call 419-665-6597.